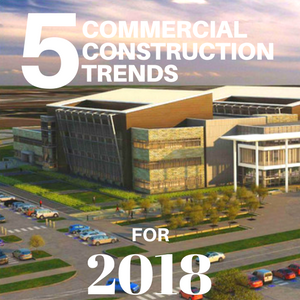 5 Commercial Construction Trends for 2018 | Stovall Construction, Inc. Businesses that have been part of the construction industry for any length of time, deal with changes on a regular basis. That’s because new trends constantly emerge, with 2018 no different, which is something that lends itself to a commercial construction company maintaining a high level of awareness in this department. Given the manpower shortage that continues to afflict every commercial construction company, certain aspects of a project have resulted in some firms taking advantage of the growing appeal of robotics. Using this technology for otherwise tedious tasks can address that problem, with potentially dangerous situations also handled in the same manner. In the latter case, that avoids safety and injury concerns. In addition, the popularity of things like augmented or virtual reality gives firms that deal in areas like office building construction a chance to actually visualize the finished work before it even begins. A commercial contractor can also use drones to assess areas that are either far apart or difficult to reach. The palate of the American consumer and how they interact when eating out has changed drastically from the meat-and-potatoes era of generations ago. That’s meant that restaurant construction has changed from simply building standard structures into ones that encompasses those new tastes and approaches. Restaurant construction in 2018 has gained more understanding about how cultures within the different genres that make up this industry translate into the building process. That communication process has helped make such a transition to new looks an easier one. On average, American society continues to age. That means that medical facilities that are factored into any office building construction need to be more accommodating to older visitors. By the same token, the growth of big businesses buying out smaller industry companies has required renovations that reflect the parent firm’s brand. In addition, the concern over comfort level and air quality have resulted in more focus on segments related to HVAC matters. The increased need for energy or technology factors have also demanded more focus from both companies and contractors. The steep decline of mall traffic over the past few decades has resulted in some becoming ghost towns. Aggressive real estate firms are seeking to fill those empty spaces with businesses that might not ordinarily be seen as mall-friendly. That’s meant more renovations to accommodate the new tenants, something that figures to remain in place this year. Ignoring this surging market is not in the best interests of any commercial construction company. Green construction remains a viable entity, not only because of environmental concerns but also due to revenue savings. The reality of Mother Nature wreaking havoc on buildings was shown frequently in 2017, meaning that embracing this approach is integral to success. The waste from any commercial construction project can be massive, which is why recycling it as much as possible continues. Among other reasons this idea has grown is that it allows for the costs associated with landfill transfers to be reduced. Stovall Construction has provided office building construction as well as restaurant construction to its clients for more than four decades. When you need a commercial contractor in the Dallas-Fort Worth area that has the experience and stays on top of what works best, contact Stovall. Do you have plans prepared by an architect and engineer?